THE PENTAGON — If recommissioned, seven retired Oliver Hazard Perry-class frigates would serve as basic surface platforms, stay close to U.S. shores, assist drug interdiction efforts or patrol the Arctic without an extensive upgrade to its combat systems, the Secretary of the Navy said on Wednesday. SECNAV Richard V. Spencer told reporters he and Chief of Naval Operations Adm. John Richardson are studying how the Navy faces-off a threat and how the Navy can best match the different types of threats. “Is a (guided-missile destroyer) DDG the thing to put for drug interdictions down in the Caribbean? I don’t think so,” Spencer said. If pressed, Spencer said he’d task the Littoral Combat Ship with assisting the Coast Guard’s drug interdiction work in U.S. 4th Fleet in the short term. But looking forward to the Navy’s stated goal of increasing its fleet size to 355 ships, Spencer said part of his planning will include considering recommissioning the seven Perrys (FFG-7). 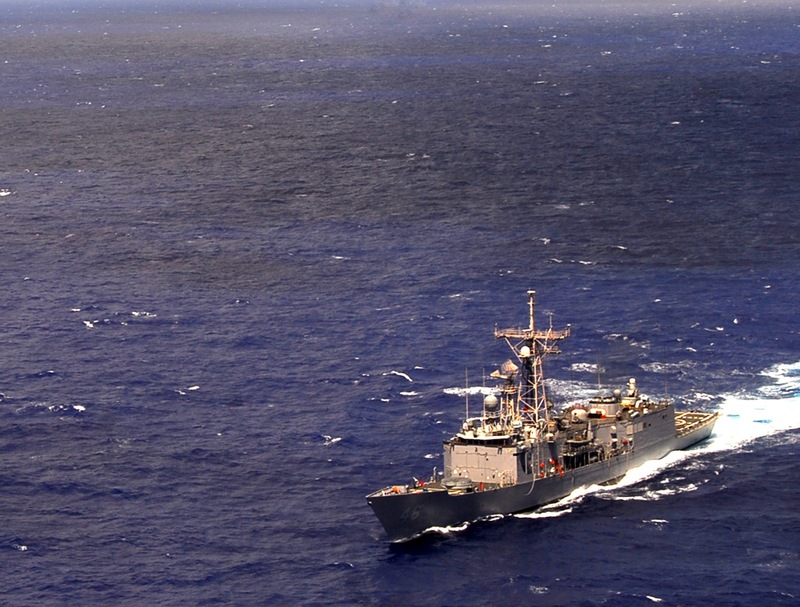 “One of the things we might look at is bringing the Perry-class to do a limited drug interdiction mode,” Spencer said. Since December, when the Navy revealed the goal of building up to a 355-ship fleet, some analysts have called for reactivating several ships from the inactive fleet. Currently, the Navy has some 50 warships considered part of the inactive fleet, but these ships are varying states of repair. While some analysts have called to reactivate other sidelined ships, such as three older Ticonderoga-class cruisers (CG-47) inactive for dozen years or the conventionally powered Kitty Hawk (CV-63) aircraft carrier, the Navy is really only considering bringing back the Perry-class ships for now. In June, when discussing the prospect of reactivating older ships including the Perry-class frigates, CNO Richardson said the process is complicated. As a ship class nears the end of its anticipated life, the Navy doesn’t invest a lot of money into keeping the class modernized, opting instead to invest money in current programs. In the 1980s, the service reactivated ships from the inactive fleet as part of the Reagan Administration’s drive to a 600-ship Navy – most notably the four Iowa-class battleships (BB-61) from World War II. What makes the Perry-class intriguing is the relative ease and low-cost to put these ships back in service, to perform specific roles, Spencer said. Supporting his point, Spencer mentioned the March deal where Taiwan spent $35,000 per-ship to put two Perry-class frigates back to sea. But for drug interdiction or operating in low threat areas, Spencer said the frigates could accomplish these important missions without expensive upgrades to weapons systems.